Where Have I Been? Writing. I have started a new art project that I am working on in spurts. Often I lay out my art supplies and move between this project and my computer when I’m writing. Gluing bits of paper to canvas board helps me work out plot points or bits of dialogue. I often do my easiest writing when I’m nowhere near my computer. This is a close up of its head with the eyes drawn in with a Sharpie. You can get an idea of what the texture of the work is like. Yesterday was a day of fun, relaxation and art-play. This little guy came to be in an atmosphere of pure exaltation of creativity. It mattered little what was created. What mattered was that I was surrounded by people who value creativity for its own sake. 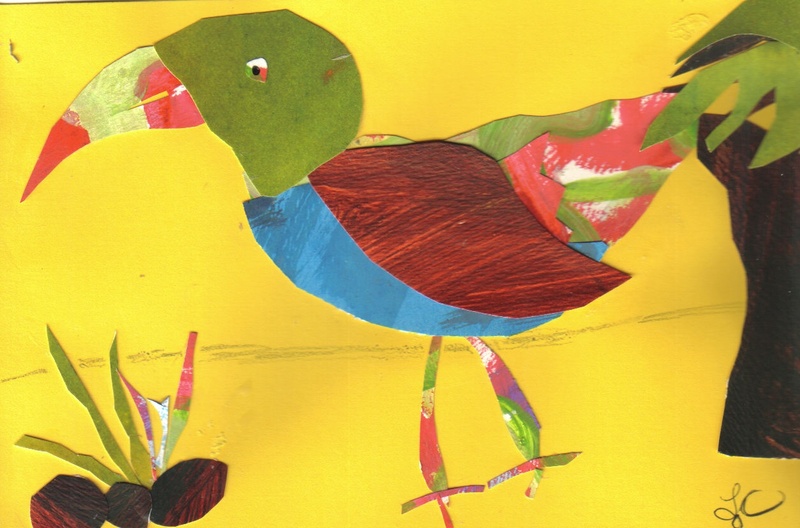 In addition to making birds, we also painted on tiny canvases and then played an art game (of our own design) with gorgeous, colorful chunks of molded polymer clay. The day was a gentle reminder that at one time we were all artists and scientists and writers and singers and wonderers and discoverers–and it’s never to late to recapture it all. Thanks to Juney and Laura for making the afternoon so enjoyable. Well, perhaps this piece isn’t quite “ready for prime-time,” but I”m done with it. It is time to work on something else. I find creating art so wonderfully relaxing and it’s a great way to spend time with my daughter. She is supervised while splashing paint around or using her markers and I get to satisfy my inexplicable urge to glue stuff to other stuff. 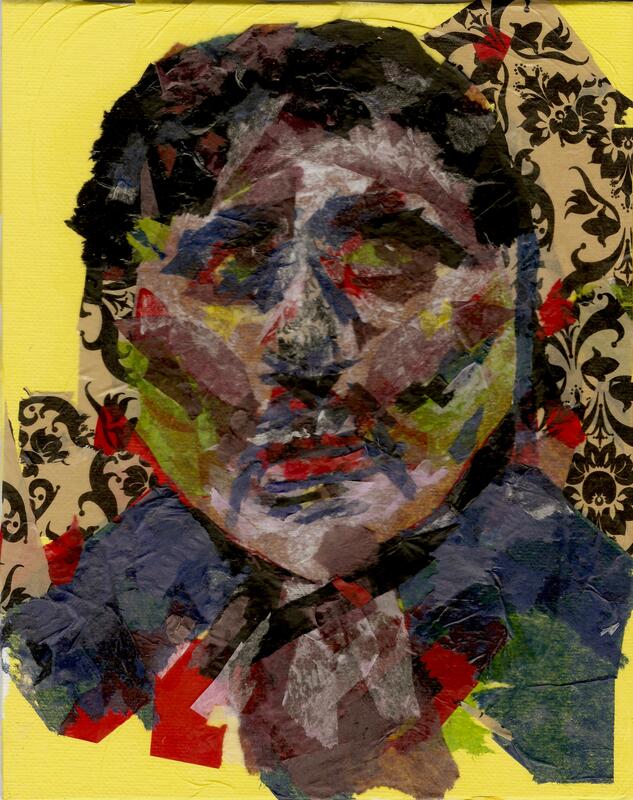 This piece is like my others, tissue paper over canvas board. I’ve started another tissue paper collage. I’m hoping that it turns out looking like a sunflower. First, I drew the flower shape lightly in pencil, then I started laying in the background. 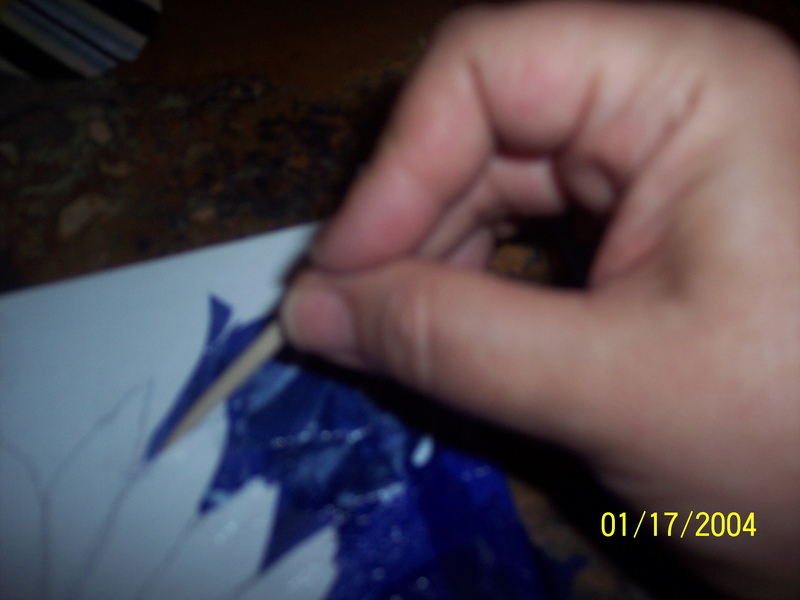 I used a craft stick (or a toothpick) to push the wet tissue into the nooks and crannies and to clean up the edges. 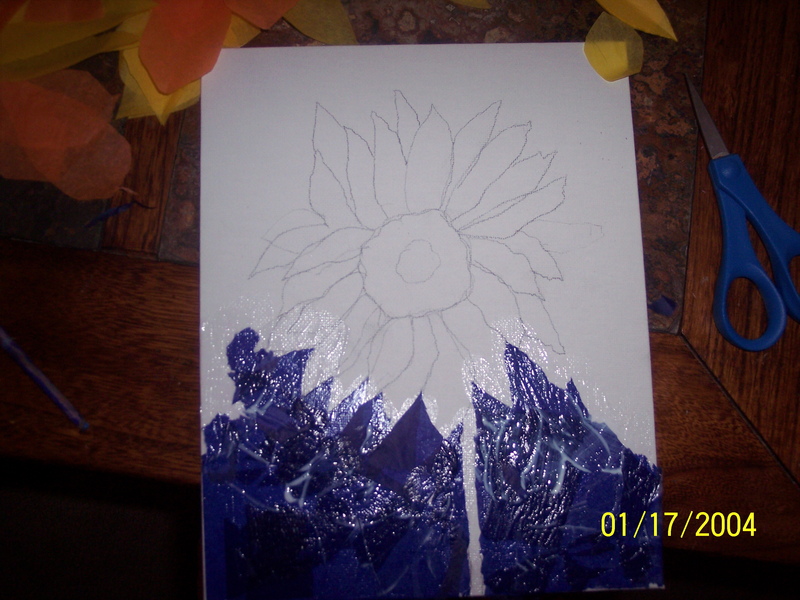 After the background was done, I started working on the petals. I didn’t worry too much about the yellow straying into the center, since that will be covered with blacks and browns. 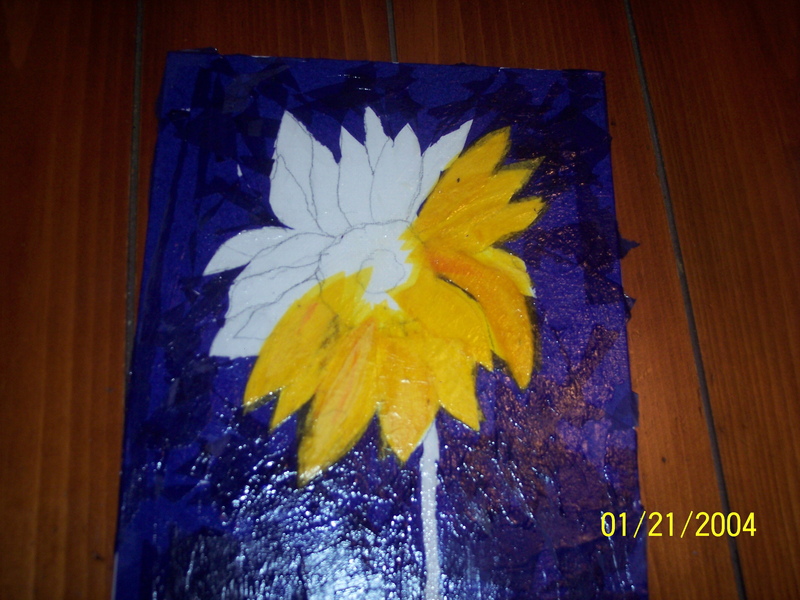 Since tissue paper is so transparent, the yellow underneath will actually help add depth to the center. I’ll keep posting the progress, but it may be a while. I only play with tissue art when I’m in the mood and have time for it. These two things only occasionally coincide. Meet Space Rooster. What is Space Rooster made of? 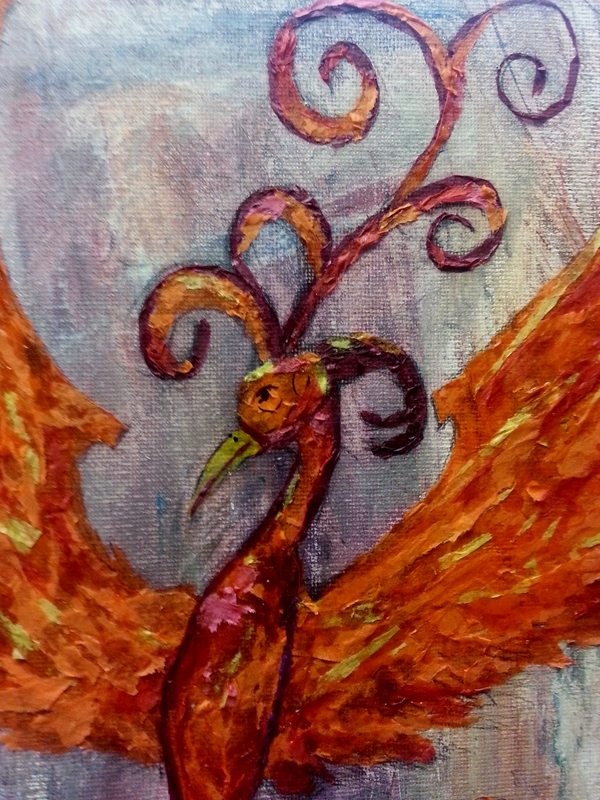 I cut the rooster shape and accompanying foreground objects from a watercolor painting I wasn’t happy with. 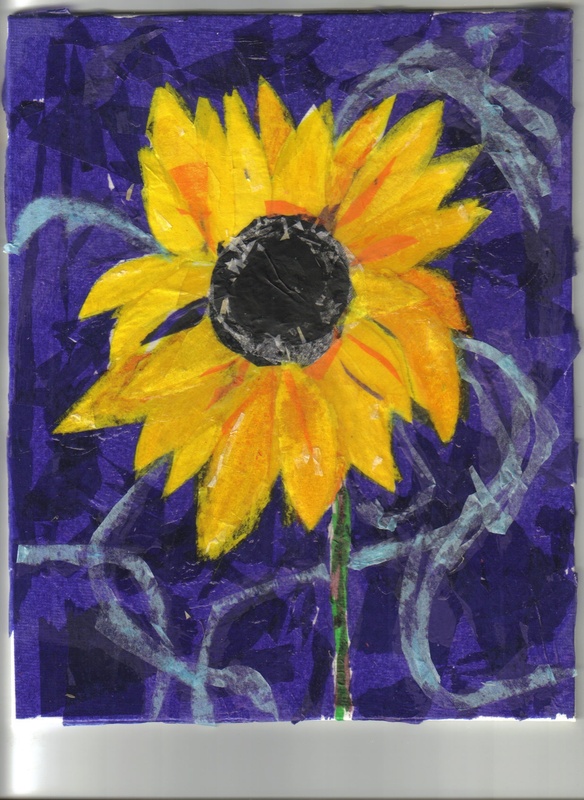 The background is watercolor over tissue paper, over cardboard. This blog will feature, I hope, many things. My writing, my thoughts, my art and more. Loretta Casteen lives in an old pecan grove cleverly disguised as a suburban neighborhood. Her checkered past includes time spent as a radio disc jockey, an advertising sales executive, a cooking website co-owner, an ad copy and news writer, a doodler, a dabbler, a dreamer, and an English Major. She is currently a wife, mom and domestic engineer--oh, and a writer. Her fiction and non-fiction has appeared in a baffling assortment of publications in print and online, including Strange Horizons, Woman's World, Pregnancy and Angels On Earth. Ralan's Webstravaganza Speculative Fiction writing markets. Frequently updated. Snellville (Market Scoops) SF/F/H market informatin and interviews.